A loan amortization is loan that is paid gradually through a period of time. It consists of a principal and an interest. In this type of loan, the interest is paid first for a specific period of time before the principal amount gets reduced. It is also called an installment loan. Mortgage loans are usually amortized loans. Loan amortizations are common in personal loans, auto loans, and home loans. They are usually from a bank or from debt consolidation. However, credit cards do not have the same features as an amortized loan. 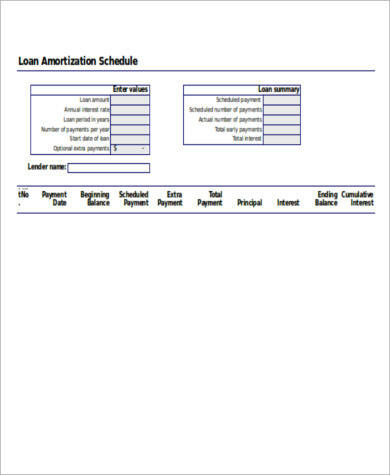 This document contains all the information that you need to know about loan amortization. 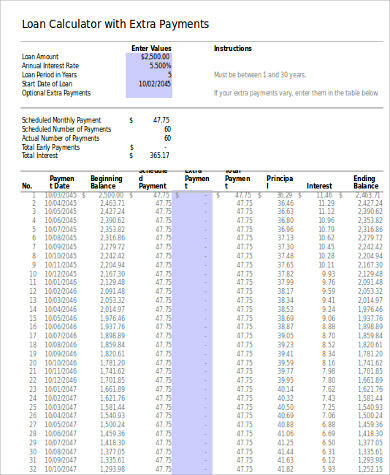 It shows the schedule of payment, the loan amount, interest rates, term of loan in years, first payment date, payment frequency, payment due date, and the principal amount. This way you can easily track your payment schedules. 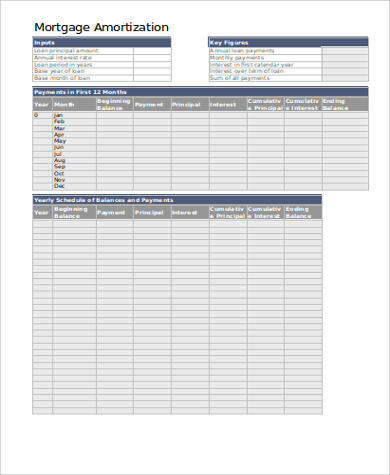 This spreadsheet provides information to analyze mortgage loans as well as an amortization table for a mortgage loan. It provides you with amount on how much you need to pay for your monthly mortgage. It also shows how much money goes to interest and how much goes to principal. 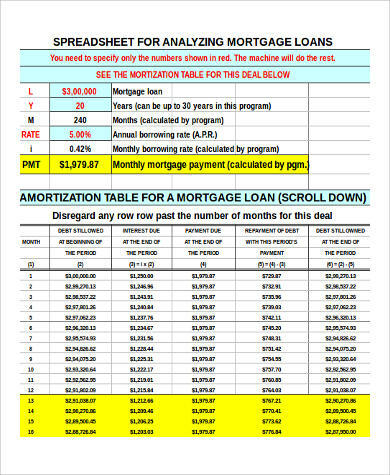 You may also want to check Mortgage Amortization Calculator Samples for more information about mortgage amortization calculators. Personal loans are loans that you can get from banks and money lenders with fixed interest rates and monthly rates. It is usually a two- to three-year term and are used mostly for small projects. Car loans are paid on a monthly basis, often paid in a five-year term. Home loans are usually a 15-year or a 30-year fixed mortgage. There is no fixed monthly fee for borrowing money from a credit card. You can borrow every month and only pay the amount you borrowed in the next month. A self-amortizing loan is a loan that consists of both principal and interest and is paid periodically. The loan will be paid off once the scheduled term has reached its end. If a borrower pays their loan according to the loan’s amortization schedule, the loan will be fully paid. This is how a fully amortized loan works. With the non-amortizing loan the value of the principal does not decrease over the life of the loan. Payments on the principal are not made while the payments on the interests are made regularly. The principal is paid in large amounts when the loan matures. One of the advantages of loan amortization is that it offers a clear monthly setup for the borrower. The amortized loan is also easy to track because the amount to be paid each month is already given. Another advantage is that you can purchase real estate properties and automobiles through an amortized loan instead of paying the full amount. Loan amortization also has disadvantages and they are usually related to equity. Amortization also goes against a lot of borrowing principles that are established by consumer advocates. 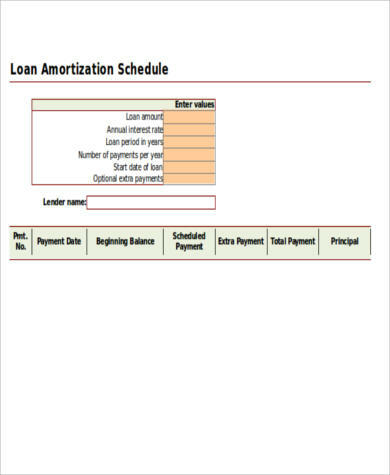 Looking into loan amortization will surely help you know more about how it works. We also have Loan Calculator Excel Samples that might come in handy as you learn more about loan amortization. What are you waiting for? Get them now!